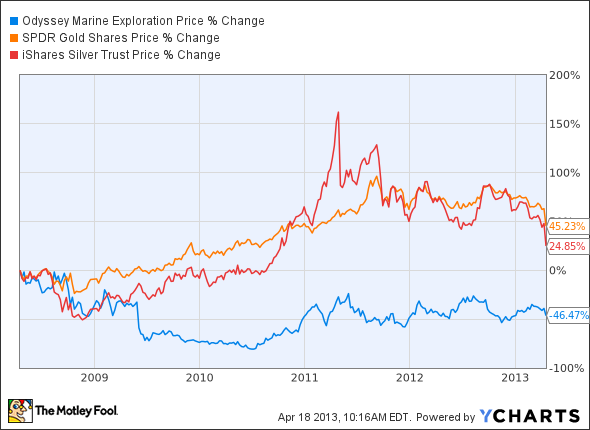 Odyssey Marine Exploration Inc (OMEX): A Mining Play That Shouldn’t Sink? Despite silver falling to around $23 an ounce, and gold going below $1,400, now might be the time to invest in Odyssey Marine Exploration Inc (NASDAQ:OMEX), the treasure-hunting shipwreck finder whose own stock is down by a third from its 52-week high. That might seem an incongruous comparison, but there’s a fairly loose correlation between how Odyssey Marine’s stock performs and the price of precious metals. Although the historical value of the sunken ships that the company locates holds some interest, it’s really the treasure in the ship’s holds that investors seek. Compare Odyssey’s price to that of SPDR Gold Shares and the iShares Silver Trust, and you can see that the three don’t necessarily walk lockstep; but they do seem to follow similar patterns. Yet, sovereign nations remain grasping, and often times, they pirate any gold, silver, or riches that Odyssey Marine Exploration Inc (NASDAQ:OMEX) and other treasure hunters bring to the surface, increasing the risks to an already risky business. Last August, Odyssey was forced by U.S. courts to turn over to Spain some $500 million worth of silver and gold coins recovered from the 1804 wreck of the Nuestra Senora de las Mercedes. Despite never determining if Spain ever legally owned the treasure, the courts said that Odyssey was obligated to turn it over to the country. Now Spain is suing Odyssey for more than $32 million in court costs. While partnering with nations to salvage shipwrecks helps mitigate the chance that a country will turn on Odyssey Marine Exploration Inc (NASDAQ:OMEX) and seize the riches found –treasure that likely would have remained sunken were it not for the efforts of the company and other salvagers — it’s become apparent that other avenues of growth are necessary if Odyssey wants to grow. That’s why the treasure hunter has partnered with exploration firms like Chatham Rock Phosphate and Neptune Minerals to recover mineral deposits on the ocean floor. Odyssey Marine Exploration Inc (NASDAQ:OMEX) has taken equity positions in both companies and has acquired a majority interest in Oceanica, a Panamanian company with exclusive permits to explore potentially mineral-rich regions. In particular, it will be pursuing three significant seabed minerals: seafloor massive sulphides, or SMS, which contain copper, zinc, gold, and silver; phosphorites for their phosphates; and polymetallic nodules, which consists primarily of manganese and iron. Because precious metals prices are depressed, and onshore mining companies find themselves in a deep hole, Odyssey’s ability to generate profits in the future will be dependent upon its success in recovering and monetizing shipwrecks, and generating income from its new mineral exploration expeditions. Relatively recent discoveries like the Gairsoppa and Mantola should allow it to fund future explorations as well as finance its mineral ventures, as well. In fact, Odyssey Marine Exploration Inc (NASDAQ:OMEX) will be exhibiting the Gairsoppa’s silver treasure in New York next month, displaying part of the 48-tons worth of silver it recovered from the ocean floor.